Welcome to Mt. Jordan Counseling! ​to encourage self-expression, self-respect, and positive relationships. 7th Grade First Generation College Student Scholarship Opportunity! Student schedules will be available through Skyward on August 15th. All efforts are made to accommodate top elective choices. However, elective courses are not guaranteed due to class availability, course conflicts, and other scheduling considerations. *The student Registration Card was submitted with the understanding that "My student and I have reviewed their class selections and understand that he/she is expected to stay in the classes for the duration of the class." *Elective class changes will be considered in special circumstances and based on class availability. Please note that many of our elective classes are full at this time. *Schedule changes will not be made to switch a class from one period to another. *Your lunch is based on your 5th period teacher’s lunch and is not something that can be changed. Please contact the Mt. Jordan Counselors with any questions or concerns: 801-826-7407​. 8th Graders- Sign up now for the "Non-Traditional Career Summit" Conference! 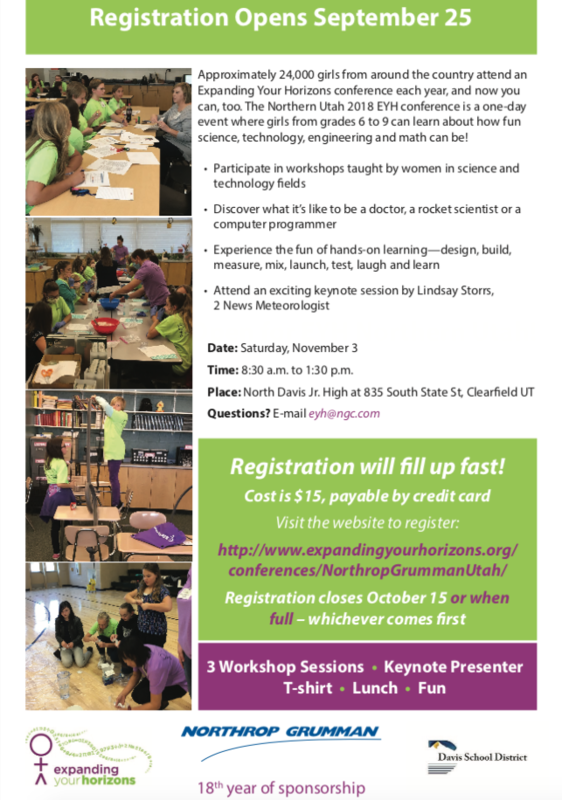 Expanding Your Horizons Conference for Girls interested in STEM! Free Screening of the Movie, "Angst" on Thursday, Sept. 6, 2018 at Jordan High! As part of Suicide Awareness Month in September, Canyons District is partnering with the Deseret News to host a free screening of the IndieFlix documentary “Angst: Raising Awareness Around Anxiety” for parents and teens. The film addresses what anxiety is — its causes and effects, and what can be done about it. The screening is free and will take place at Jordan High School (95 Beetdigger Blvd.) on Thursday, Sept. 6th at 6:30 p.m. The film will be followed by a panel discussion featuring local mental-health experts. Please visit the link below for more details on the film and to reserve a spot for the screening. *Elective schedule changes will be considered based on class availability. Please note that many of our elective classes are full at this time. *Last day for schedule changes will be Wednesday August 30th. CVHS offers a variety of courses for original and make up high school credit. 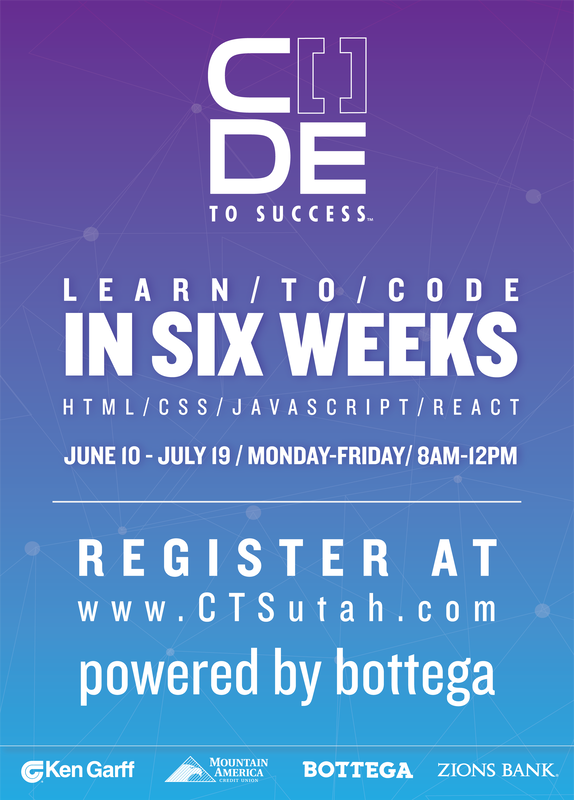 Visit ﻿http://cvhs.canyonsdistrict.org﻿ for more information. 6th grade course request cards are due to student's current 5th grade teacher by February 9th. 7th and 8th grade course request cards (current 6th and 7th) are due to the student's Social Studies teacher by February 14th. See flyer below for more information on how to get involved. The Assistance League of Salt Lake is offering dental service for students who need emergency dental care and are not insured. The Assistance League will cover up to $1,000 if the treatment is done by one of their approved dentists. Please contact the Counseling Center for more information on how to access this service. 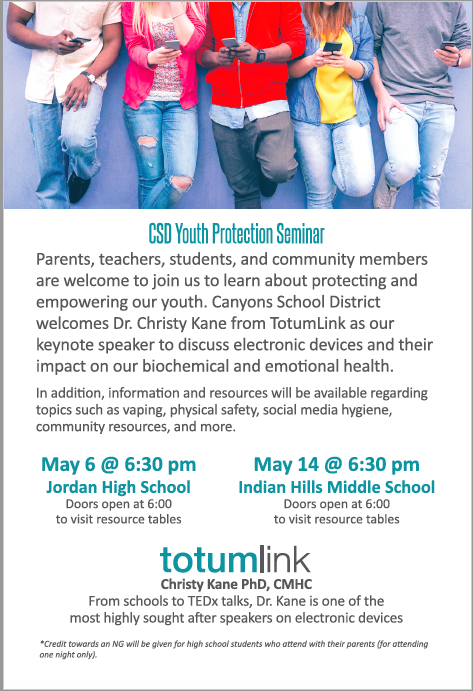 Canyons School District is implementing a new suicide prevention program for the 7th grade Health classes. To learn more about the curriculum, please come to the Lifelines session during parent-teacher conferences: Tuesday October 6th and 8th at 5:30pm. If you have any questions or concerns, please contact the Counseling Center. Math Lab is now open! What: A chance to get help with classroom curriculum and homework from teachers and tutors.